Why does SaveAndReplay Love OTA HDTV ? Companies like Antennas Direct, Winegard and Channel Master have been in business for over 60 years in the old business of VHF Antennas. In the old days this rendered a snowy picture and folks used to hang these Antennas high on huge towers. Now with the switch over to digital Television and the new UHF standard the new wave of HDTV Antennas gives a crystal clear picture better then any satellite provider can give you or any HD box currently on the market. OTA gives you HDTV at up to 1080i for many broadcasts. This new method of off air broadcasts using DTV digital TV ,UHF instead of VHF is huge, with high bandwidth and little to no compression. If you have purchased a HDTV and want to see true HD , OTA is the best way to go. What's more it has no monthly fee. Why would anyone get basic cable pay around $30 a month and receive no HD or DTV (Digital TV) picture. It makes no sense at all. More and more Canadians are cancelling their cable (cutting the cord) and moving to Over the Air (OTA ). If you have an older style TV you will need a digital converter box to receive these new UHF feeds with your antenna. If you have purchased your HDTV in the last 8 years and bought a named brand TV, more then likely your new TV is already equipped with an ATSC tuner which makes it ready with a good HDTV antenna to receive OTA HDTV. Why does Save And Replay Strongly recommend OTA as a clear Winner besides the obvious reasons? 1. Most people want local TV, for example in Toronto GTA area people want City TV, CBC, Global, CTV, CTV2, Omni 1, Omni 2, TVO, CHCH , YesTV), and US networks like PBS, WNED, Think bright, NBC, JusticeTV, Escape, LAff TV, AntennaTV, GritTV, ABC, CBS, Fox 29, MY TV, The CW, The country network, ION, Qubo, Ion Life, TCT, TCT Kids, WBBZ METV, Daystar and This TV. 2. Once you have an Antenna and either a newer style TV (HDTV), with an ATSC built in tuner, its totally FREE, Yes no monthly bills to pay, get your major networks, your Canadian content and also true US content all for Free without any monthly charge! Companies that provide cable and satellite have made millions from people because they all want the local channels and major networks and are willing to pay for this. Now its Free. 3. Its not only free but most of it is in HD, yes over the air (OTA HDTV). That is the most amazing thing. No HD can compare to OTA HDTV, the quality is far superior to cable or any satellite provider as there is little to no compression. 4. If your TV is capable OTA comes with a broadcasted guide unlike conventional paid for cable services. Yes it tells you what shows are playing at what time and even detailed info on that show. 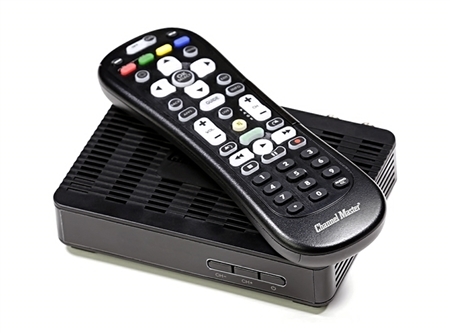 The Channel Master DVR+ CM7500 are able to give you a guide. This is why we at SaveAndReplay are glad to see Companies like Antennas Direct, Channel Master and Winegard surpass all goals and expectations and we truly believe that when it comes to high standards for you the consumer products from Antennas Direct, Winegard and Channel Master are from old antenna manufacturers, time and time again giving you a better reception and award winning design and products for your entertainment pleasure! Choosing equipment from trusted true manufactures to get you the best possible viewing experience! We are Canadian distributors for Antennas Direct, Channel Master and Winegard, for Over the air (OTA) selling antennas, pre-amps, distribution amplifiers, converter boxes and Antenna mounting hardware. We also sell Products like Ooma for home phone and the powerful streaming Kodi G-Box with Offices in Toronto GTA, Calgary, Vancouver, Montreal, Winnipeg and a retail save and replay store and warehouse in Mississauga, Ontario! SaveAndReplay has become known for carrying products that give you the best in FREE TV (No Monthly Bills). OTA (Over the Air) with the use of a HD Antenna allows you to get some of the best local television networks in HD, and the HDTV quality broadcasted from OTA is better then cable or satellite. OTA has become a good substitute for basic cable networks with a better digital reception and better quality uncompressed HD then any subscribed service can currently offer you with no monthly bills. We also carry products like Ooma which allows you to still have a home phone, keep your existing number and get Canada wide calling all for just over $4 a month. We also carry streaming boxes loaded with Kodi like the G-Box from Matricom. Cutting the cord from Cable or Satellite has never been easier, say goodbye to monthly bills and watch the best Free HD TV channels. Consult with Save and replay to see how you can join the growing trend to cut the cord and watch more and more Free HD TV using a HD TV antenna and a streaming tv box. Please email us at sales@saveandreplay.com if you have ditched cable or satellite for over the air , OTA and are receiving all your television broadcasts via an off air antenna and how much you are saving a month as we have calculated at least 40 people a week on average over 64 Months, since Jan 2009, from our customers have ditched cable and or satellite. If the Average is $50 a month on these bills, currently not including the many people we don't get feedback from, or customers that appreciate true HD, and may still keep their monthly subscription as well? That would mean currently Save And Replay has helped customers by saving them $554,000 a month on TV monthly payments, that's over 6 Million, to be exact that's $6,656,000 a year in collective savings! This is in no means the total number of sales of Antennas and the trend, as we also sell to dealers, ship, and don't always know, what people are doing. We believe this figure is much much higher as we only get 15% feedback on total sales in terms of who has ditched a subscription service! We are currently selling over 1000 antennas a month, the CRTC states that 6% of people are using an antenna, we believe this figure is much higher. Most common customer comment is in shock at the ATSC raw HD quality and crisp sharpness. They thought they were paying for good quality HD. Second most comment is the internet gives us everything else, spending money on the internet and free local broadcasts from all major networks is all we need! People are tired and fed up of repeats, and paying monthly for it. After 31st August 2011 for Canada is a new era for over the air broadcasts. its the Canadian digital transition, this will effect anyone that uses an over the air system in major cities and towns across Canada. Over the air will stop broadcasting in Analog and will continue broadcasting major networks in digital and HD. We have had countless people call us after talking to a cable or satellite sales rep and being told that the Antenna will no longer work. Please tell them to go to the CRTC website or the Save And Replay store and see what we are watching. Say goodbye to your television bill and welcome HD and digital TV signals into your expensive television. PLEASE NOTE: For people that have purchased cloned or other antennas from elsewhere coming to our store for help, will be asked to contact the people they purchased from. We only support our products and people that purchase equipment from us! We are not here to help and support people that purchase other equipment from elsewhere! If you have purchased Antenna gear from someone else please contact them for any assistance you require! Cut the cord and save money with no monthly bills. More and more people are cutting the cord and saying goodbye to paying for television programming and in return they are getting crystal clear uncompressed HD over the air signals from an Antenna receiving channels like CBC, CTV ,CHCH, TVO, Global, CityTV, Omni 1, Omni 2, PBS, CBS, NBC, ABC, Fox and many more in most cases well over 25 channels if not over 30 most in HD and many more in Standard digital. With the option of getting all your local content in HD, put together with a good streaming box like the G-Box you wont miss your monthly bill and still watch TV with BETTER quality than a paid subscription. You can also PVR over the air and get all the bells and whisles that you are used to, without paying a monthly fee! Come see why more and more people are saying goodbye to a paid subscription at worse quailty and talk to the over the air experts! Cut the cord and join the thousands of Canadians that are enjoying HDTV without a cable or satellite subscription free. Why is OTA a clear winner and why does Save And Replay love over the air (O.T.A)? 1. Most people want local TV and major networks and end up paying cable and satellite companies to receive these broadcasts in worse quality than you can receive for free on a HD TV Antenna over the air. 2. Once you have an antenna and either a newer style TV with an ATSC tuner or a digital converter box you get these broadcasts for Free in Digital DTV, without a monthly cable or satellite bill. 3. Its not only 100% FREE, most of its in stunning uncompressed HD, Yes OTA (over the air) is in HDTV for free, so why would you pay cable or satellite for local broadcasts and get non digital feeds and worse HD? It makes no sense does it? 4. If your TV has the ability to get a guide you will receive a full guide with info on most channels, does your monthly cable provider give this for your monthly bill? If you are paying for basic cable or satellite for your local networks and not even receiving it in HD or Digital quality then its time to think about what you are doing and take a look at OTA and say goodbye to cable TV ,start saving your money and receive a better picture on your TV! Even customers that subscribe to cable or satellite and are paying for HD or analogue signals are turning to the uncompressed full 1080i HD raw signal, on an antenna. Yes an antenna is far better than satellite or cable and really shows what your television is capable of! Read our Over the Air (O.T.A) section for more information on receiving Free Digital HD signals using an Antenna subscription free HDTV with no monthly bills, no cable no problem! See the channels you can get in your area! and take the step to cutting the wire/cord and become subscription free today! 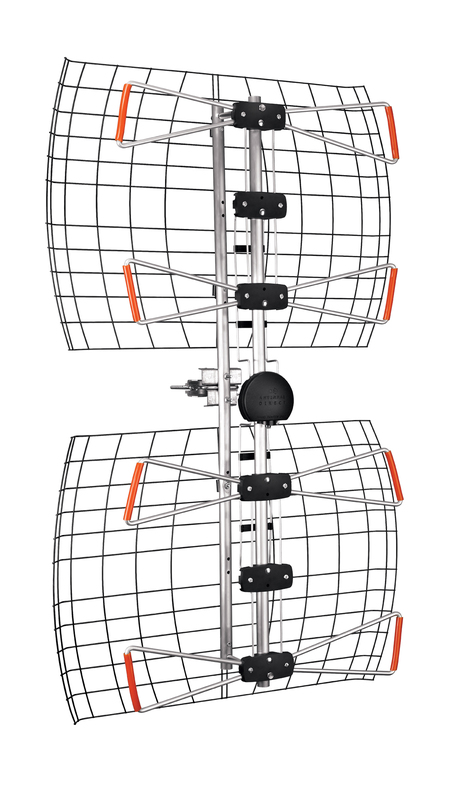 Extended range 60 + Miles 60 degree beamwidth, 15DB gain will outperform any of its competitors 8 bay Antennas. 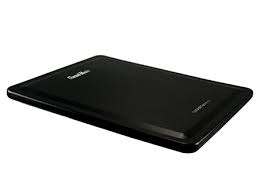 Has a wide beam and is our number one seller for most locations espcially the GTA toronto area. 70+ Miles range, 17.4 dB gain, and still a wide pull for an 8 bay antenna. This is the world's most powerful 8-bay technology antenna. With a very high gain and the ability to make it work like 2 x DB4e's and point in different directions, to optimize your channel line up. Our Second most popular antenna. The channel master 7500 DVR+ is a top class PVR solution for those using an over the air Antenna for Free HDTV. With HDMI out the picture is crisp, the tuner is sensitive and its performance and features are second to none. A dual tuner, record from the guide, Pause and play live tv. Our top pick and highest selling Pre-amp, it has the lowest noise 1 db, a usb power supply and transformer which is used internally and the mast mounted pre-amp like all Over the air (O.T.A) preamp's is powered via coax (RG6). Coupled with overload resistance makes this an extremely popular amplifer solution for ATSC signals. Ooma Home phone with crystal clear HD Voice. Has all the features of a land line port your existing phone number and pay just over $4 a month canada wide calling and cheap long distance. Winegard flatwave air, sleek small compact amplifed HDTV Antenna. Comes with J-Pole mount and great for dealing with bouncing signals with built in UHF and VHF Amplifer. 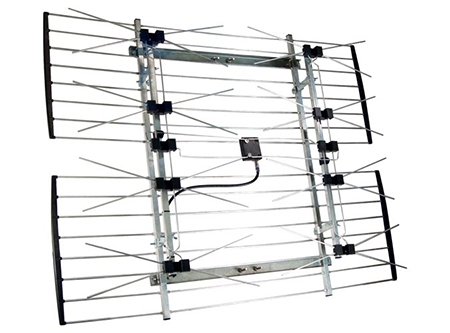 Channel Master 5020 Masterpiece HDTV Antenna, Yagi Style for ddep fringe locations, when trying to receive towers that are far away. does both UHF and VHF as well as FM over the air OTA signals. 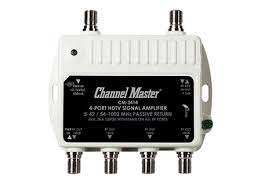 Channel Master 3414 Distribution Amplifier to boast your signals adnd maintian the signal from your HDTV antenna when going to multiple Televisions. 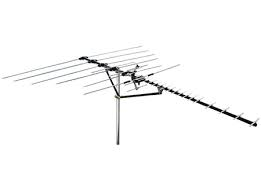 Channel Master 4228HD (CM-4228HD) 8 bay bowtie HD TV UHF Antenna. Rooftop HD TV Antenna for over the air ATSC HD and digital tv (DTV) signals. Antennas Direct Clearstream 2 Max indoor or outdoor HD TV multi-directional UHF and VHF HD TV antenna with mount. Recieve crystal clear HD for free with no subscription and cut the cord from cable or satellite today! 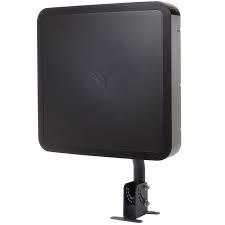 Channel Master 3000HD CM-3000HD smartenna omni-directional HDTV Antenna does both UHF and VHF. 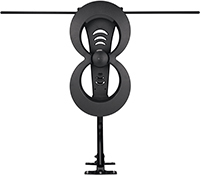 Sleek flat discrete indoor or outdoor HDTV Antenna. Allows for mounting with a U-bolt on a J mount (J-Pole) or mast. 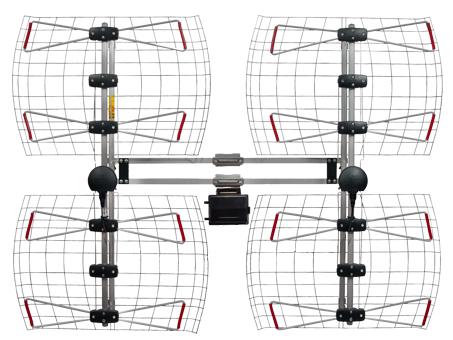 The Channel Master 5020 Masterpiece CM5020 Yagi traditional deep fringe high gain HDTV Antenna. Does all frequencies UHF, VHF and FM. Directional over the air off air ariel works well when aiming and far away towers or combined with the channel master 9521a rotor. 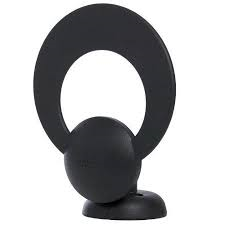 Antennas Direct Clearstream C1 convertiable which is designed to be either an indoor table top rabbit ear HDTV Antenna, wall mounted indoor antenna or add the reflector and it becomes an outdoor HDTV antenna, cut the cord from cable or satellite today!